Hi. My name is James Morrison. I live in Arcata, and currently work at Humboldt Brews in addition to running Humboldt Event Services. I was raised in the Sacramento valley, spending a lot of time working at my parents restaurant, bar, and catering service: Morrison’s Upstairs. On a busy day the entire operation would feed over 500 people. 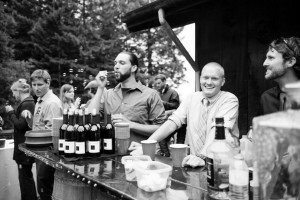 Before moving to Humboldt County in 2009 I had spent ten years bartending and organizing all sorts of events. I have experience with large weddings, small house parties for twenty people, and seminars for 500 people at UC Davis. I have bartended them all. I’ve poured drinks in bars, barns, fields, forests, wineries, beaches, boats, and once in a pool. Since moving to Humboldt County I started bartending for my friend’s and families weddings. Hiring me helped them lower the cost of there bar, without lowering the quality of drinks and service. The few brides I have helped have been able to spend more money on decorations, food, and equipment because they allow me to organize and staff the bar. Let me and my friends give you the same service and attention to detail that I would give to any of my friends and family. All of the bartenders and servers that work the events are employed in different restaurants and bars in the area. 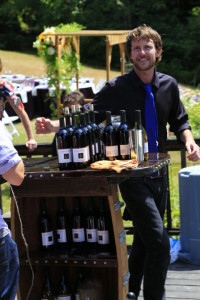 The bartender or server for your event will be selected based on availability, specialty, and your budget. A veteran of the service industry with ten years of experience as a server and bartender & can be found working at Brio Café when she is not working a private catered event. Currently works at Brick and Fire with seven years of experience as a server & bartender.